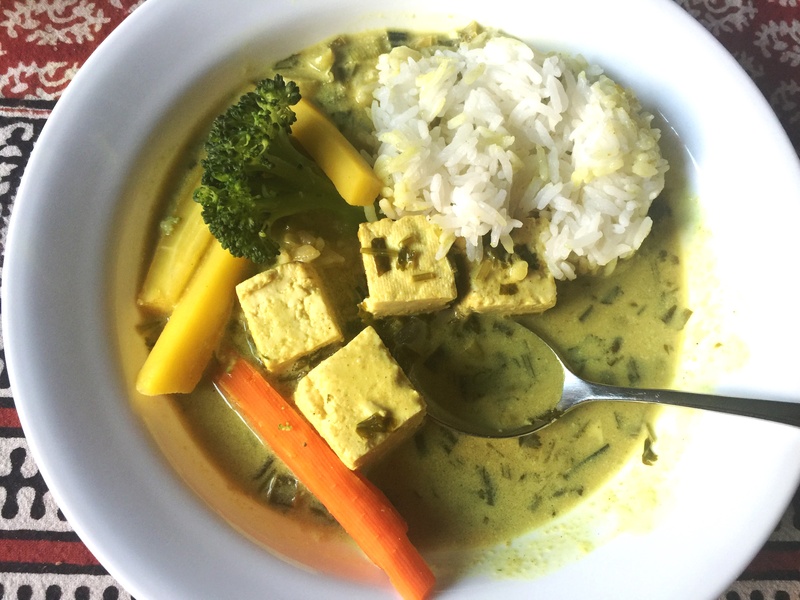 This tofu curry I found on LA Fuji Mama is from Jamie Oliver’s Food Revolution. It isn’t Indian or Thai or really any specific cuisine. It is just coconut milk flavored with curry powder, green onions and cilantro. Simple, nice and tasty. My 16 month old son ate so much, he had a Buddha belly! We had this with steamed carrots and broccoli, and jasmine rice. Heat olive oil in a saute pan and add the green onions and curry powder. Let sizzle for a couple of minutes. Add the butter, coconut milk, water, cilantro and salt and cook for at least 10 minutes to let the flavors meld. Add lemon and tofu and heat through. Enjoy!